2016 is the 800th anniversary of this ancient Norman church, and 2016 will end with a spectacular Christmas Concert featuring the fifty members of the award-winning Wessex Male Voice Choir on Friday 16th December. The doors will open at 6:30pm and the concert will start at 7:00pm sharp ending at 8:30 pm. The concert, like many events in Longcot, was the brain-child of Dr John Forster who, despite being diagnosed with cancer, continued to throw himself in the village’s fundraising efforts to support our ‘Longcot 800’ campaign to raise enough funds to transform the church into a multi-purpose community facility so it will be able to host meetings, events and activities as well as regular services. Sadly, Dr. John passed away in late August, but one of his last requests was that the church roof will be well and truly raised on 16th December. Always ready to crack a joke, he suggested that Adult tickets bought before 8:00 am on December 1st be sold for just £8.00 the numbers echoing the 800th anniversary. After that, tickets will become a still-affordable £10.00. Junior tickets for under 18s will cost £5.00. As well as traditional seasonal music including a couple of carols, the concert will be filled with songs from musical theatre to present day pop, spirituals, and folk as well as traditional favourites for male choir. Their Chamber Choir will also be performing some wonderful classical pieces. 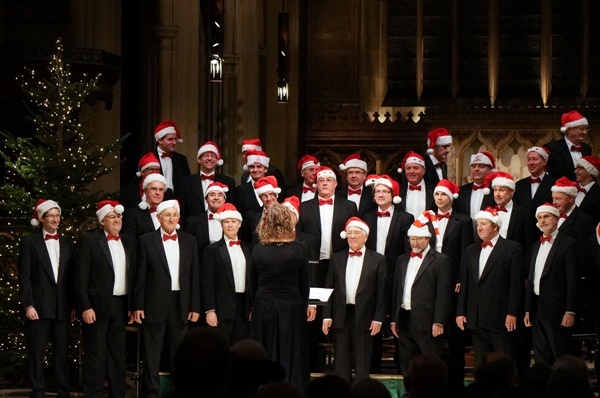 The Wessex Male Choir was founded in 2001 and consists of some 50 members under their recently appointed Musical Director, Rhiannon Williams-Hale. It has built a reputation for its professionalism and entertaining repertoire, and is always in great demand. As well as frequent performances in London and the South West, it performs across Europe and has led the singing at Wembley and Twickenham. Among the numerous awards and competition trophies, Wessex Male Choir won the prestigious Male Choir competition at the Llangollen International Eisteddfod in July 2011 beating renowned choirs from Wales, England, and the USA. This year, the Choir won the coveted Gold Cup at the Cheltenham Festival of Performing Arts for best choir overall making it their third win since 2008. When a choir wins as many awards as this one – and with Aled Jones as their patron – everyone can expect a thrilling evening that will not only welcome in Christmas, but act as a great reminder of the kindness and community support of Dr. John Forster. Longcot’s Christmas Concert takes place on Friday 16th December 2016. Doors open at 6.30pm. The concert starts at 7.00pm prompt and ends at 8.30pm with a 20-minute interval. There will be a licensed bar. More event information and tickets for the Wessex Male Choir Christmas Concert at St Mary’s Church, Longcot, on December 16th at 6:30 pm are available online at our own page on Eventbrite. Please could you tell me where the brickworks used to be and when it closed also could you tell me where I could find houses built with bricks from this brickworks.